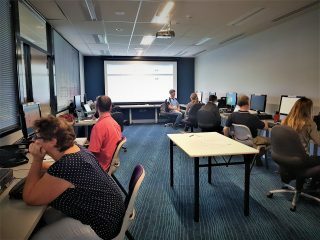 Chris and I recently took a trip down to Bunbury to run a ‘show and tell’ of the new features in GRID, our easy to use, online Geographical Information System built for, and by, the Natural Resource Management (NRM) community. On this trip, we provided an overview of GRID’s new features with staff from the various offices of the South-West Catchments Council (SWCC). Staff came from across the South-West region of Western Austalia, including some remote participants connecting via Google Hangouts. The Bunbury Regional Library provided a computer room to serve as our “classroom” for the day and was conveniently just a stone’s throw from Café 140 (side note: they didn’t have cafes as nice as this one when I lived in Bunbury!). As seems to be expected when you hire rooms, there were some technical difficulties with the projector and wifi, but we pushed on. GRID serves multiple purposes for multiple people, even just within one organisation. Among attendees that day alone we had people who relied on SWCC GRID for data management, data extraction for further interrogation in a desktop GIS program (mainly QGIS, which we have been helping SWCC with for a while now – and released our environmental training as a free on-line course recently), a range of mapping and reporting tasks, investigating what activities are taking place in neighbouring regions, and even managing volunteer groups and their associated on-ground activities. With such a diverse range of applications by the people that use it, it’s clear GRID needs to be versatile, and any additions we make must both cater to the needs of one group of people whilst also not limiting others. This balance can be delicate and tricky to achieve, despite our clients all being in the NRM space, and is something we are continually attempting to improve. As we’ve come to suspect, it seems that most people don’t read our email communications or the release notes that document the new features that we release in each new GRID build, so although we had excitedly described these new features previously, most people in the room were unaware the features even existed. As an example, as we described the ‘new’ filtering options (which were released in 1.3 back in September 2017), faces lit up around the room. “I didn’t even know I could do that”. This has led us to rethink the way we announce upgrades and features in future and really assess the best way to convey the information so that it reaches people, and they truly understand the new features and what they can do… perhaps time for more online videos! With these GRID training ‘update’ sessions, Chris and I have endeavoured to create a comfortable training environment without too rigid of a structure. The benefit to this personable approach is participants relax and talk to us honestly about anything and everything GRID-related, giving us some very valuable feedback. The little ‘whinges’ that people may have had at the back of their mind tend to get expressed, and often they are actually things that are caused by a misunderstanding, and many are already solvable, or are easily fixable. Best of all, the things that aren’t immediately rectifiable help us to create two lists – a ‘Fix It’ list for immediate investigation when we get back to the office, and a ‘Wishlist’ for future upgrades. Being face to face with clients really allows us to flesh out Wishlist ideas and bounce them off others in the room for refining. This all goes into our work towards the next roadmapping session we will have with our customers for GRID (where we’ll roll out the GRID Bucks, just like we did last year). Chris discussing enhancement ideas with Joanna while we show off some shiny new GRID features. This particular session with SWCC was jam-packed with information, both giving and receiving, and went well and truly went over schedule. But the invaluable feedback we received made every minute worthwhile. Some of our descriptions of the new features were a little confusing for participants, because I had assumed (wrongly!) that all attendees were well-practiced in using GRID. We need to put aside any assumptions and cater to the least experienced people in the room, which can be a real challenge – but that’s something to work on in future. During demos, everything can go wrong will go wrong. Wifi, projectors, remote connections, internet speeds… So we need to be (even more) prepared, set up exceedingly early, and have a backup plan for everything – and make sure a good cafe is close by! And speaking of which, put a time limit on coffee breaks or you’ll lose half the class for an extended period! We always love catching up with the crew at SWCC and for me, I got to put more faces to the names I hear on the phone. I know that all our team are very grateful to have such a fantastic client relationship and look forward to putting all the feedback to use. If you’d like to know more about GRID, or how we can deliver training for you, then feel free to contact either email myself or Chris, call us on (08) 92277309 or start a conversation with us on Facebook, Twitter or LinkedIn.